We have done a French Canadian playlist previously that you may have thought was for the province of Quebec but no it was not. That playlist focused on songs in French and while many of the artists were indeed from Quebec that was not the focus of that one. Today’s playlist is focused on the high quality music that comes out of Quebec, some of it in French but predominantly in English this time. I love the music coming out of this province very much. Time and time again I will hear some music that catches my ear and it becomes a new favourite. I then find out that the artist is from Quebec, Montreal in particular, and am not surprised. It has a music scene with a lot of depth and seems to be very collaborative. Members of one band combine with members of another and make a new band or artists recording with other artists and so on and so on. It is a place I just imagine all these wonderful artists hanging out and jamming and seeing what sounds they can come up with. It is a place I would love to spend some time listening to those sounds they come up with live. For now I take great pleasure in listening to the recordings they send out to us. Thank you Quebec for all the quality music you have brought to our ears and our hearts. Keep it up! *Their base is up around Maniwaki, but their “traditional lands” — don’t ask, that expression could be defined in many ways, given changes over time — include both sides of the Ottawa River. Having actually read that article, I must retract “They’re ticked off that they weren’t included”, because the chief says they’d never be part of such “a deal with the devil” as the Ontario Algonquins have. Good morning! What a great playlist, I’m really enjoying it so far! Re all those “Québec” bands, I feel that while many are indeed Québec-born, many others are more Montreal-incubated. Montréal would be, outside of its own self having its own characteristics, “cheap Toronto”. Or maybe less Toronto. That is the way it goes. While I am very much biased towards Montreal bands, these were what my searches for Canadian Indie in Quebec came up with. The Ontario playlist was heavy on Toronto bands as well. Manitoba was heavy on Winnipeg bands, etc. I imagine it’s much easier for musicians to make a living in the bigger city centres of the province than in smaller regions. Yeah, darbar, that was just an observation, not a criticism. Hey thanks @Darbs! Checkout out the playlist now. Understood Benoit. Sorry if I sounded defensive. Times have changed but it does seem it is still a bit easier to relocate to the bigger centres if you want to make a career out of it. A Holiday Tracks Spotify playlist from BreakOutWest for your holiday listening pleasure. My good friend Sharon has a song that made it on there too. 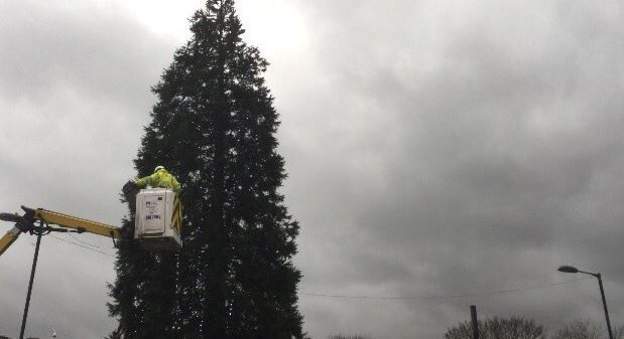 Contractors have been in Hetton le Hole for the last five hours putting lights on the Christmas tree which had left some residents underwhelmed. Bad weather meant most of the lights failed on the tree. Hetton Town Council has now replaced them. Another problems looming though – it’s a Canadian giant redwood and growing at 7ft a year. It could eventually reach more than 300ft. OK I’m late to this but nothing wrong with being incubated in Montreal! Still a Montreal band in my view. I’d even say a Quebec band.